If I had to pick just one type of work to stock my practical life shelves with, it would be sewing. I am NOT an accomplished sewer. Actually, I think it has been over a year since I pulled out my sewing machine, and then I prefer to make clothing with elasticized waists. But, when it comes to the classroom, I think nothing beats handwork. Maria Montessori stated that the activities of practical life should be meaningful, looking around my classroom, I wanted to find activities that still had meaning for today’s children. Polishing is great, but how many children really see their parents polishing the silver place settings? Spooning, tonging, pouring and the like are quickly mastered when we leave the lessons simple and isolated on the tray. What materials could we use that would appeal to the 3 year-old and remained enticing through age 6 or beyond? Sewing. A child’s engagement with practical life materials is what prepares him for later success in the classroom. 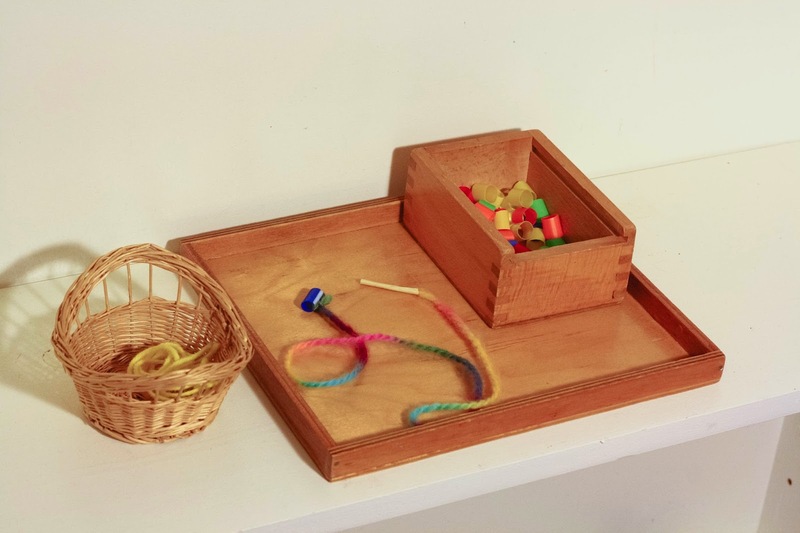 These handwork activities directly tie into the main goals of Montessori practical life works — coordination, concentration, independence and a sense of order. These truly are the most important goals of the Montessori pedagogy. Without a strong foundation in practical life, the child won’t have the necessary skills to be able to do the bank game, the moveable alphabet and such. Through my observations in my class, I always find that sewing works produce the deepest moments of concentration of any of the practical life works I have available. We group our sewing works into four general categories — preliminary activities, early sewing, intermediate sewing, and advanced. We do follow a sequence, where different lessons build on one another, and the child does have to master some skills before moving to the next lesson. At the moment we have over 30 sewing lessons and projects that we use in our classroom. As you can tell, I really like sewing, and because of this, we have an entire sewing shelf in our classroom. Do you need a whole shelf? No, not at all, these works can easily be incorporated into an existing practical life area, or an art area. 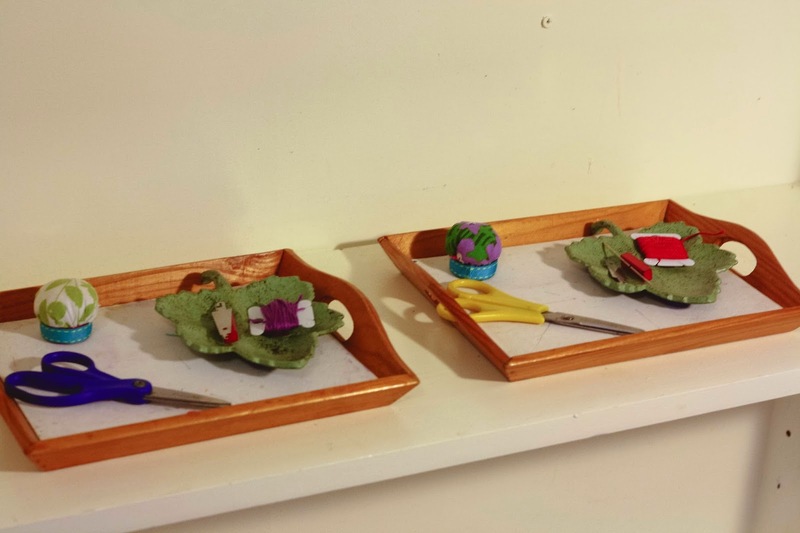 Last year, for our class of 22 children, we had two dedicated sewing trays and then about 4 to 6 self-contained sewing works on the sewing shelf at any given time. Depending on your home or class, you can adjust as needed. • Assortment or felt, cloth, buttons, and various colors of embroidery floss, all in different containers. These are added to the shelf as we introduce new works that need the materials. This seems like such a simple work, but I think it is an important part of our sewing curriculum. It is a work that some of our youngest children can do right at the beginning of the year, and as we increase the difficultly by changing the beads and the thread, it remains relevant — and really what child doesn’t love to make a necklace. • Prepared strings in a container on the shelf. I measure the string to fit my neck, that way they are always long enough. Tie one bead to the end of the string, and place a piece of tape on the other end. • Container with beading materials on a tray. • Invite the child to the lesson. • Show them how to take a string from the container (we leave the sting container on the shelf) and take the tray to the table. • Holding string in subdominant hand, use dominant hand to add beads to the necklace. • Help child tie necklace. • We do not limit the amount of beads a child can use. • We start the year with yarn and wide straws. Then we move through regular straws, large pony beads, smaller pony beads, perler beads and then mixed beads. For the string we go from tape tipped thick yarn, to thinner yarn and finally elastic string. • We do help children tie their necklaces, but each time we do it we show them, like a mini lesson. • By the end of the year we like to have a container with the spool of elastic thread and a pair of scissors on the shelf. The child can then cut their own thread and prepare the necklace on their own. • A container holding postcards (or the front of greeting cards). 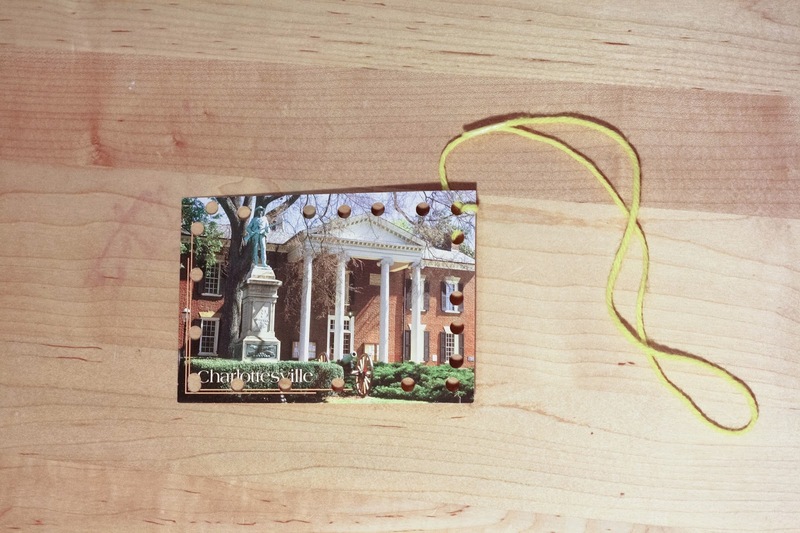 The cards have holes punched around the edge and a length of yarn tipped with tape and attached to the post card. 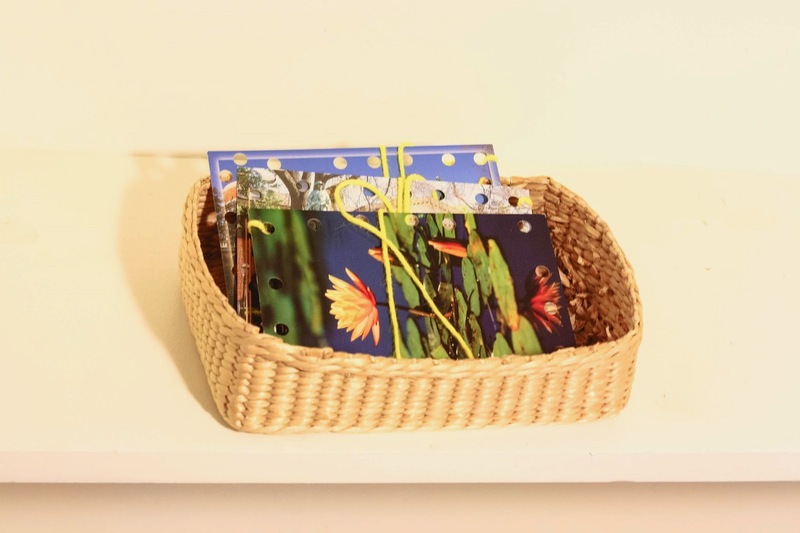 • Invite child to take a postcard from the basket. • Take the material to the table. • Holding the card in the subdominant hand, use the dominant hand to go “up from the bottom, down from the top,” through the prepunched holes, demonstrating a running stitch. • Invite the child to try. • Child can take home the postcard when finished. Notes: Most likely, the child will not sew perfectly along the edge when they start this work, and that is fine! It is just a reminder that next time we see the child choose that work, we might want to come over and sit and simply say, “up from the bottom, down from the top” for a few of the stitches and then allow them to practice on their own. Some years we have set this up as a self-contained activity, but there are plenty of years that we just incorporate this into the early sewing works. It doesn't matter how you want to use it, the basic lesson remains the same. • Invite the child to the lesson and take the tray to the table. • Place the needle in the pin cushion, showing that the eye is still up. • Take the needle threader in the dominant hand and slide the large hook through the eye — do not let go of the needle threader. • Pick up the thread with the subdominant hand, place it over the hook with about a two-inch tail at one end. • Using the dominant hand that is still holding the needle threader, pull the hook of the needle threader back through the eye and until one end of the thread has come through the eye, you will have to brace the needle with the subdominant hand. • Point out that there is an end of the thread on each side of the eye. • Remove the threader, invite the child to try. 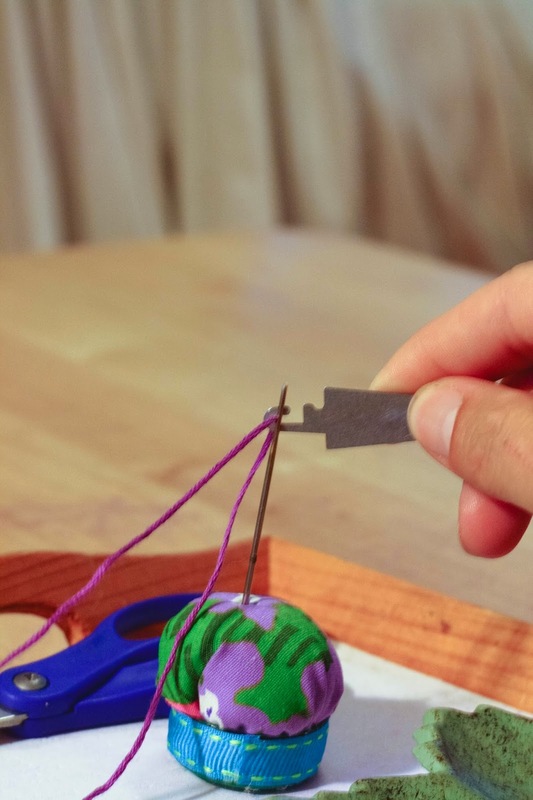 • This is a hard task to master, often with younger children, I place my hands over their hands as they guide the needle threader through the eye, and I help them keep it steady as they place the thread on the hook. • The hook can get caught on the side of the needle, I try to show the child what has happened (otherwise they just keep pulling), and then we push the needle threader back through and try to remove it again slowly. • We don’t require perfect mastery of needle threading before the child moves on, but we do have them practice as often as possible. If they are still struggling, we have the ask an older child to held, or if we are available, we will represent the lesson. Again, this is not a work we set-up as a self-contained lesson every year. Usually, I just give the knot tying lesson as part of the early lessons on sewing. If a child can’t tie a knot, when they have finished their sewing, they come to a teacher or an older child and we do this as a mini-lesson with their work. The above video gives you somewhat of an idea of how we help the child with the initial lesson. • Invite the child to the lesson and take the materials to the table. • Measure the thread and cut. We use the measurement of the length of the table or the length of the child’s arm — it ends up begin about 20 inches. Based on your environment, you can adjust your method of measuring the thread. • Remove the needle from the pincushion. • Holding the ends of the thread in the dominant hand, make sure they are even and the needle is in the middle of the thread. • Now, also in the dominate hand, grab the end of the needle by the eye. • With the subdominant hand, grasp the hanging floss in the middle. • With the subdominant hand, wrap the floss around the needle three times. • Now hold the tip of the needle with the subdominant hand. • Slide the dominant hand grip up to include the thread that was wrapped around the needle. • Holding the tip of the needle with the subdominant hand, slide the dominant hand (which is holding the wrapped thread) off the end of the needle and to the end of the thread. • This is one of the lessons that I usually do in an interactive fashion, rather than the traditional Montessori way of the teacher presenting the whole lesson, and then inviting the child. Since it is so complex, I find that children tend to master it faster if we do it together, and I use my hands to guide them — hand over hand. 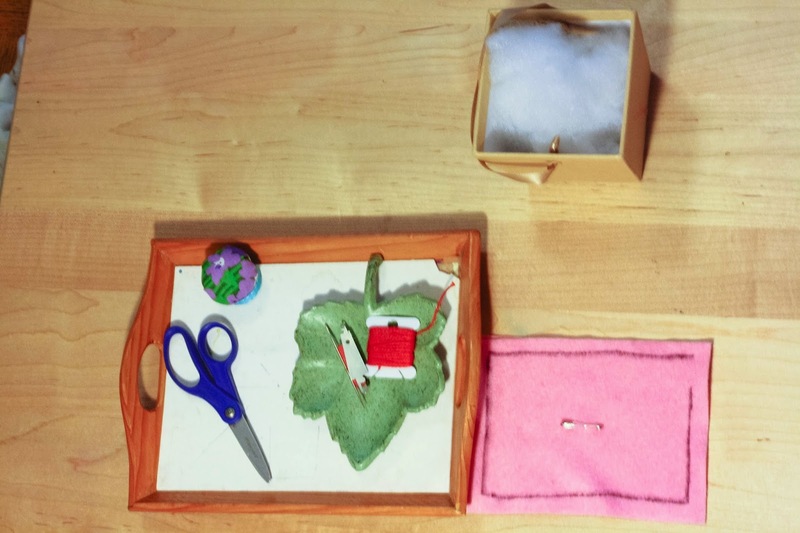 • This is a challenging lesson, and again if a child hasn’t mastered it, we just continue to give this mini-lesson into what ever sewing work they are doing. • If a child develops another way of tying a knot, fantastic! • A variety of embroidery hoops — I prefer the sturdy plastic ones, but any will do. • Invite the child to the lesson, gather the materials and take them to the table. • Have the child thread the needle and tie a knot, help as needed. 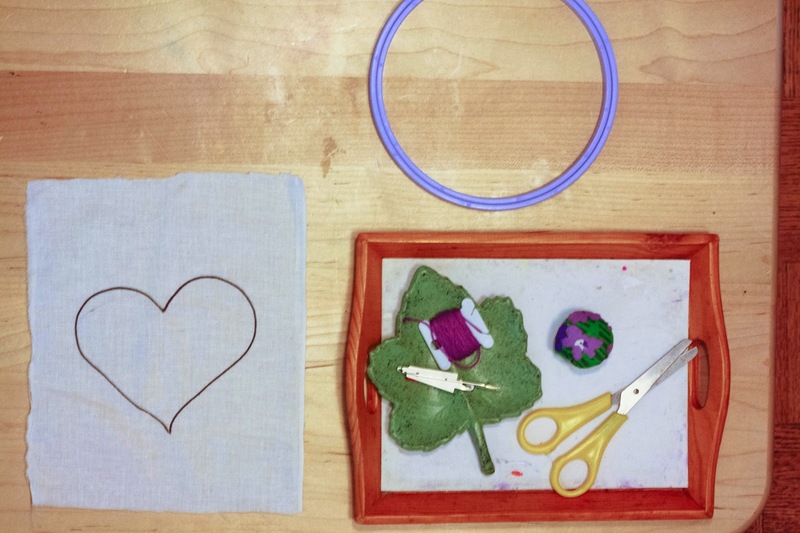 • Demonstrate how to open the embroider hoop — close it and invite child to open it. • Lay the bottom hoop on the table, and then place the cloth on top. Push the second hoop over the top and tighten the hoops. • Hold the hoop in the subdominant hand and the needle in the dominant hand. • Sew up from the bottom, following the line for the shape. • Continue to sew along the line. • Tie a knot when finished. • Return the materials to the shelf. Usually I demonstrate “missing” the line when coming up from the bottom, and then pulling the needle out to reposition the needle on the line. • Invite the child to the lesson, take all the materials to the table. • Have the child thread the needle and tie a knot. • Using the marker, draw a line around the pillow, about 1/4 of an inch from the edge. Do not connect the line, rather leave a 1 inch space between the two ends. This step is only necessary when a child is new to pillow sewing, once they are use to the idea that they have to stop short so they can stuff the pillow, it is no long needed. • Show the child to start at one end, and use a running stitch to sew along the line to the other end. • Once the child has reached the other end they tie a knot. • Remove the safety-pin and set to the side. • Felt Pillow - Stuff the pillow with the poly-fil. • Fabric Pillow - Turn pillow right side out by pushing it through the opening. The child will most likely need help with this the first few times. It can be helpful to have an orange stick to help poke the cornets out. Then stuff with poly-fil. • Have the child re-thread the needle and tie a knot. • Sew the pillow closed. • Return the materials to the shelf — have a space to collect safety pins. • Invite the child to the lesson, and take the materials to the table. • Thread the end of the yarn all the way through the tube so it peeks out the end. • Starting with the pop. stick at 12 o’clock, wrap the yarn around once in a clockwise direction. • Move to the stick at 9 o’clock and wrap in a clockwise direction. • Repeat for the 6 o’clock stick. • Same for the 3 o’clock stick – (it should look like a square spider web). 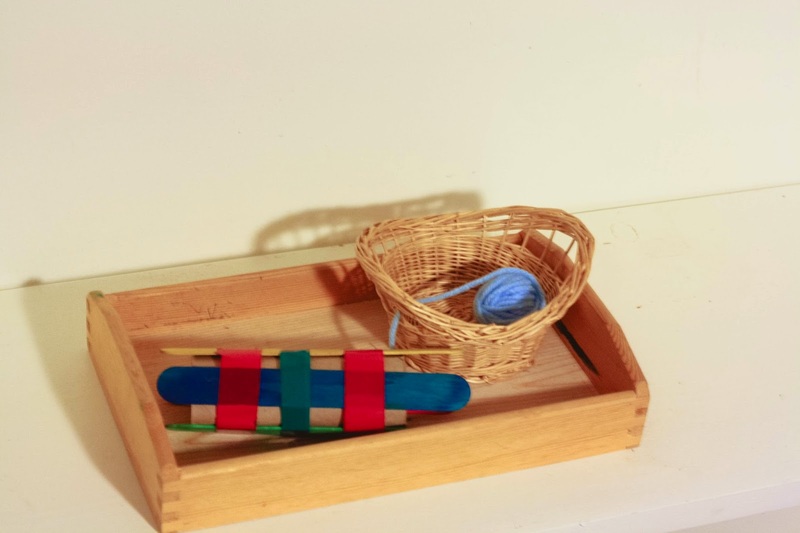 • To knit, have the child place the yarn over the next stick on the outside of the tube (continuing to work counter clockwise) and then pull the bottom yarn over the top yarn and off the popsicle stick. • Continue in a counter clockwise direction (it is easy and natural for the child to hold the tube near their stomach and turn the tube as they work. • To finish, cut the working end from the ball, and then thread the end under the loop and then remove the loop from the stick. Repeat for all sticks. • To make it really secure, I then loop the end through the last loop that was removed and tie a knot. • For a while we help the child get set up and usually help them make the first round of stitches. We do give them the opportunity to do as much as they can, moving from actually doing the set-up for them, to taking them through it. • I use this story that reinforces the work that they are doing. The child is a sheep farmer and the first loop on the stick is the sheep, and then the child builds a fence (lay the yarn across the stick, above the first loop), but the sheep jumps over (move lower loop over top loop) and this continues around the knitter. 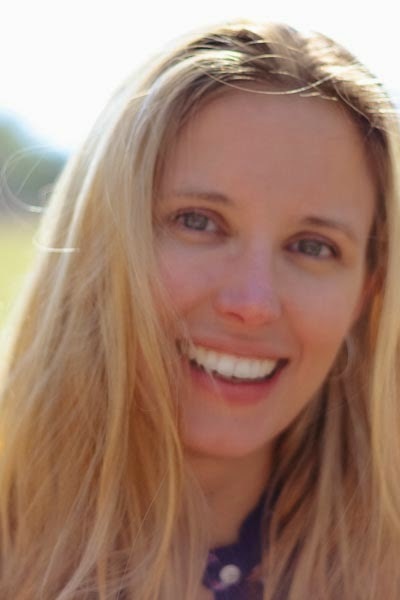 Aimee is Primary Montessori teachers and blogs at montessori works. She lives in Virginia with her husband, her 14 year-old stepdaughter, 5 year-old daughter, scruffy dog and two new hermit crabs. She is currently working on a book that outlines the 30+ sewing works that she uses in her class. You can follow her in Pinterest or Facebook. Are you looking for affordable Montessori lessons and activities! 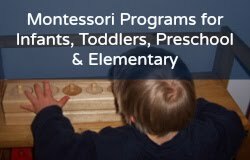 Check out Lisa Nolan's affordable online Montessori PDFs and programs! [M o n t e s s o r i f o r t h e E a r t h]. Welcome, I'm Lisa Nolan of Montessori for the Earth and Montessori on a Budget, to name a few! Montessori & the benefits of the geoboard! Montessori AMS or AMI Training?